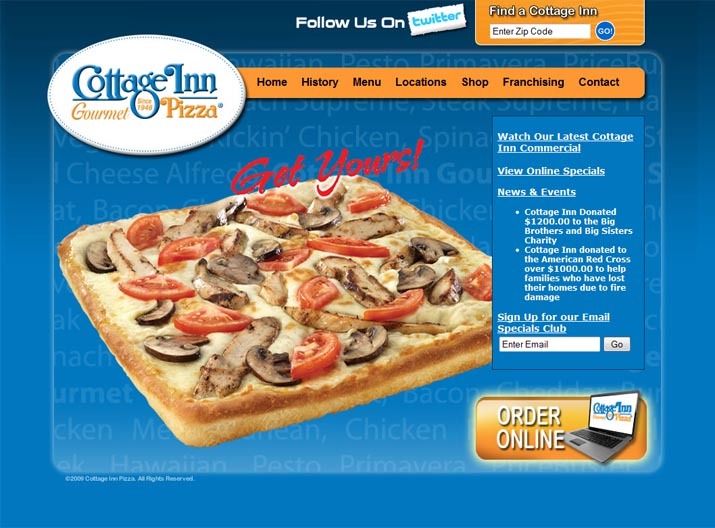 Cottage Inn, Inc.-The first Cottage Inn restaurant opened it's doors at 512 East William, Ann Arbor in 1948. This restaurant has had the distinction of being the first restaurant in Ann Arbor to serve pizza. The current ownership acquired the building at 512 E. William in 1961 and it remains the company's flagship today. The restaurant's first major expansion took place in 1975. The restaurant was remodeled again in 1980 and 1987. In 1993, a major renovation of the resaurant was done to include the second floor, which increased the seat capacity. This renovation also provided banquet room facilities. The restaurant offers a diverse menu of Italian and Greek dishes as well as their pizzas. Needless to say, we continue to serve a lot of the best pizza in town.